When the discussion turns to the phono preamps (short for pre-amplifier) we are really getting down into minute details of the record groove in order to understand its role and its importance. It is essential that you understand the role of the phono preamp as it will affect the decisions that you will make about purchasing equipment and ultimately the pleasure derived from your “Classic Vinyl Listening Experience”. 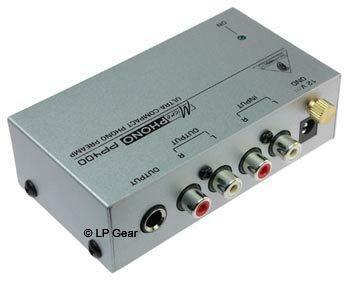 A phono preamp is the device that amplifies the sound that comes from the phono cartridge so that the main power amp can then further amplify the sound so that you can knock the pictures off the wall when you crank up the volume. Without a phono preamp you can barely hear a record. (Note: This occurs when you plug a turntable into an amplifier input labeled something other than PHONO on your amplifier). This is because the PHONO input on your amplifier has a phono preamp (also called a “phono stage”) in its circuitry. To bring the explanation full circle, it is the job of the phono cartridge to turn the vibrations of the stylus into an electrical impulse. A phono cartridge essentially creates an electrical signal because the stylus is attached to a magnet within a coil which as you may recall generates electricity when the magnet is moved back and forth within a coil. But as you can imagine, the electrical signal that comes from a little phono cartridge is extremely small and hence the need to amplify it even before it reaches the main amplifier, hence the name phono preamp. As you may recall, when a stylus is following the path of the record groove it encounters constant sideways movement (lateral, left and right, back and forth) of the stylus. These movements are the sounds that you hear once greatly amplified. The movements with the widest back and forth swings are the very lowest and loudest vibrations. This was a problem since the amount of space to allow for these movements back and forth was quite wide because the wide spacing greatly reduced how many revolutions the groove could make on the surface of a record. So a method was devised to de-emphasize the lower frequencies when cutting (creating) a record, while also over-emphasizing the higher frequencies. This allowed the record to be cut using less width so that more revolutions could be fit into the vinyl record and hence the improvement in playback time. This is important: On playback the reverse is true. The low frequencies are over-emphasized and the high frequencies are de-emphasized. This process has the overall effect of “equalizing” the recording. It’s like dividing by 2 and then multiplying by 2; you end up with the same answer. But this technique has the advantage of providing for more playing time on the record. Officially, this process is known as the “RIAA Curve” for record creation and playback.